Schell Games Art Blog: Challenge #1 - Pirates!! And remember, this one is all about character, so a background isn't necessary. But hey, if ya feel the itch (no not that, the one to make a background...) then go for it! If you miss the deadline, then naturally, you WALK THE PLANK!!! I'll leave you with a larger version of the drawings up there in the banner. 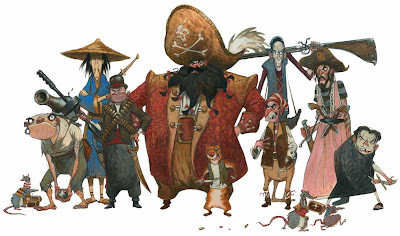 This was some concept art for a possible Monkey Island movie that got canned 3 or 4 years ago. Good 'ol Captain LeChuck and his crew. Remember the point of this whole thing everyone, HAVE FUN! !